The single jersey knitting machine becomes more automatic which can produce weave chromspun ,single-side cloth,float design cloth,scale cloth,PK cloth, dobby,twill cloth,industrial cloth,color wash cloth and so on. 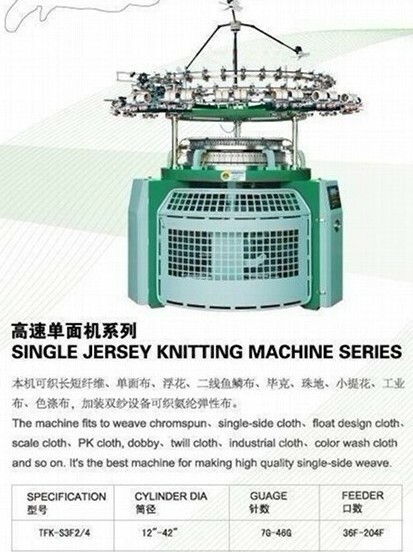 Its the best machine for making high quality single-side weave. May you understand if i disturb you. Our company is specialized in producing circular knitting machine.30 years ago, Taifan was established in Taoyuan, Taiwan, and in the year of 1999 Taifan started production factory in China mainland. Our company has been in this field for about 20 years, in the last 20 years, we have established a good business relationship with 23 countries, such as Sri Lanka, Iran, Russia, Thailand, Turkey and so on. Taifan brand circular knitting machine enjoys a good reputation and good market all over the world.